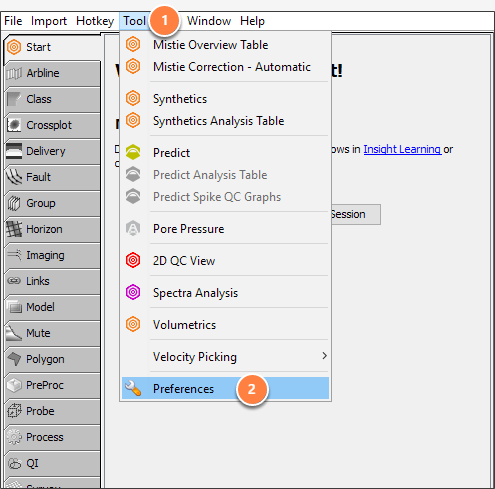 This setting controls the unit system used to display most values. It affects only the display, and does not change the underlying data. Project Units: Display and calculate depth, length, area or volume using the units from the project coordinate system (see Creating a Project). International Metres: Display units in metres. Calculate depth, length, area or volume using the units from the project coordinate system and convert them to metres for display. International Feet: Display units in international feet. 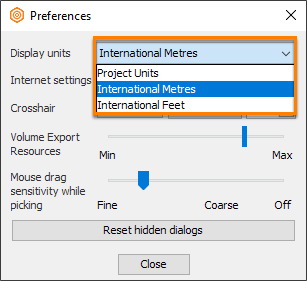 Calculate depth, length, area or volume using the units from the project coordinate system and convert them to international feet for display. Network Settings: Configure the network connection settings used for error reporting and licensing (see Configuring Proxy Settings). Crosshair: Change the appearance of the crosshair. Volume Export Resources: Set the amount of resources allocated for exporting. This affects new exports and exports in progress. Running exports may take a few minutes to change to the new setting. Mouse drag sensitivity while picking: The distance required before a mouse click is registered as dragging. The sensitivity decreases as you move the slider from Fine, Coarse to Off. Reset hidden dialogs: Reset information dialogs that have been dismissed; e.g. instructions for the screen capture tool. 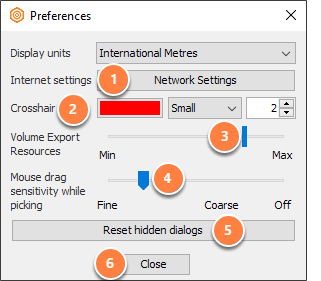 Close: Exit the Preferences window.